Register for free today for this day-long series of webinars and connect for any and all topics of interest. Attendees will learn current advances and trends in the importance of geosynthetics in a variety of civil engineering applications: landfills, coal combustion residuals (CCRs), CQA procedures, geomembrane durabiltity and service life, wrinkles, and more. Course attendees can earn up to six (6) PDHs. Once registered, attendees can connect for as many of the topics as they choose. Each topic/presentation will last approximately one hour (40-45 minutes presentation, 10-15 minutes questions/answers). 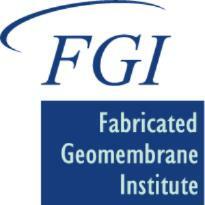 The FGI has created a Standard Specification for Polypropylene Geomembranes that covers both reinforced (fPP-R) and unreinforced (fPP) flexible polypropylene geomembranes that represent an industry standard for high quality products. The FGI Polypropylene Specification covers unreinforced material thicknesses of 30, 40, and 60 mil geomembranes. The specification also covers reinforced material thicknesses of 30, 36, 45, and 60 mil geomembranes. · New PVC Specification – The FGI is working to create an updated PVC specification that will provide the end user with a more consistent and high quality industrial grade PVC. · Columbus Reservoir Paper – A journal paper is being written on the largest containment project in the world that shows factory fabricated seams are more consistent and at least 10% stronger than field seams. · Video library of ASTM Test Methods – The FGI is in the process of developing a library of high quality videos for our website and YouTube channel that explain and demonstrate all of the different ASTM test methods used for testing flexible geomembranes. 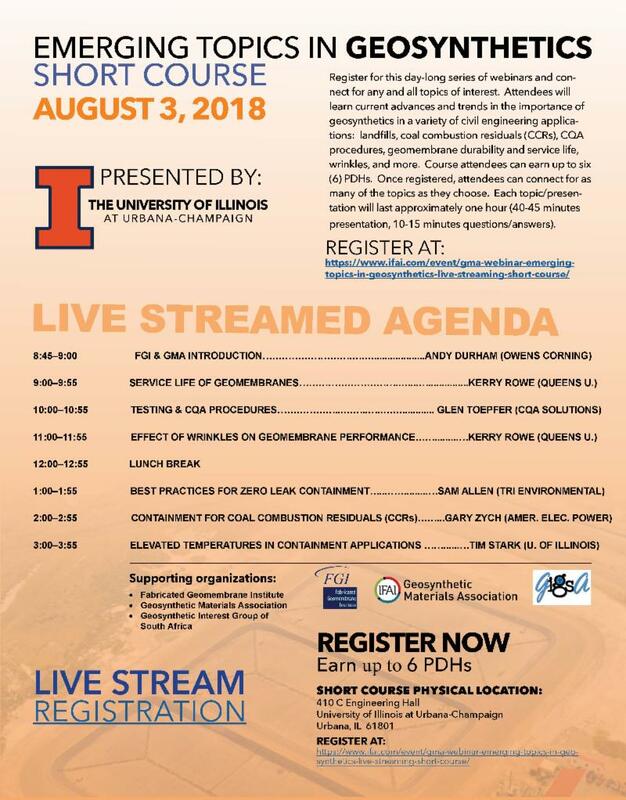 · Short Courses – The FGI has two additional short courses scheduled for 2018 that will address Geosynthetics in Civil Engineering Applications: Friday, August 3, 2018 at the University of Illinois at Urbana-Champaign (will also be recorded and live-streamed in collaboration with GMA) and Wednesday, October 24, 2018 at Saginaw Valley State University (in collaboration with Consumers Energy and Plastatech). 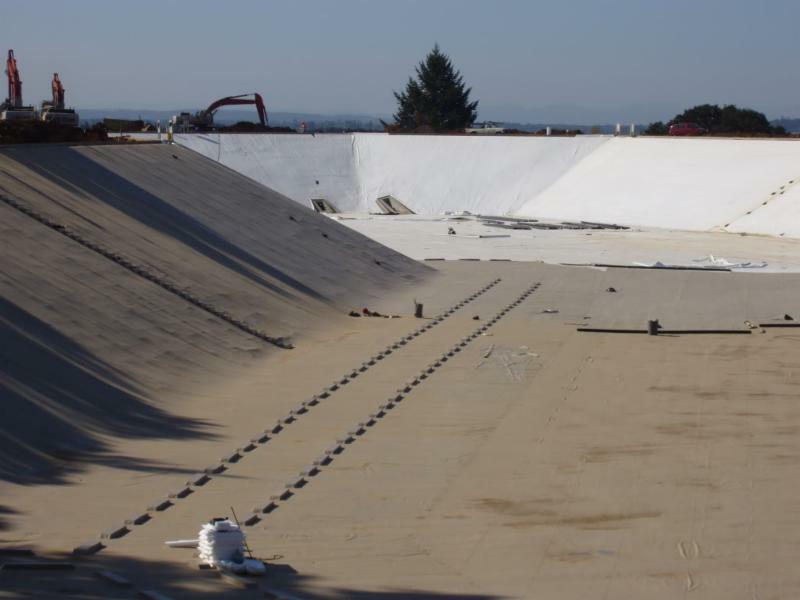 · Clay v. Geomembrane Costs Paper – Conference paper is being written to highlight the benefits and cost savings of using geomembranes over compacted clay soil for containment applications. · RPP Project Case Study – The FGI is working on a case study of a premature failure of an RPP pond liner system, along with a new installation of an RPE system including mechanical attachment, venting system, ballast system to prevent uplift if ground water becomes an issue, anchor trench, underlayment, pipe details and panel fabrication. · Installation Details – The FGI is creating a library of installation details for engineers and clients to download from the FGI website in both PDF and DWG formats.